Trying to figure out if there is a problem with Direct Import from my Wells Fargo checking account. To the best of my recollection, I haven’t seen signs of an Import all week. Elena at YNAB I think I'm having the same issue with my Wells Fargo account. I joined YNAB on the 18th, and my transactions haven't shown up on YNAB yet. Hector Valles Hey Hector. My Direct Imports appears to be working again. I’ve received two rounds of imports recently. Anything on your end? I have tried multiple attempts at Direct Import from Wells Fargo but YNAB keeps failing. I am just starting the trial and I have the same problem. 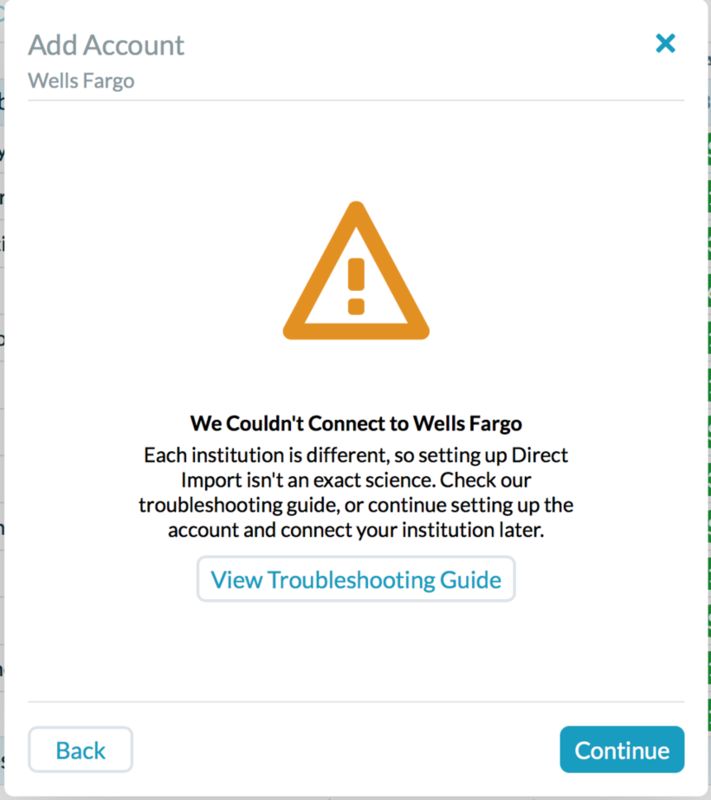 I cannot seem to connect Wells Fargo after having tried all the tips. It's my primary account and if I can't get it working I will have to look at other options. Orange Admiral Thanks for letting us know! There may be something bigger brewing with WF at the moment, so we've alerted our Direct Import partner and they are on the case! In the meantime, have you tried File-Based Importing to help keep up with your transactions? It's dead easy, because you can drag and drop a file containing your transactions right into YNAB! I have Wells Fargo and have imported and direct connected several times this past week no issues. I'm also unable to connect to my Wells Fargo accounts. WF holds my primary checking account so this is really limiting the functionality of YNAB for me. Ivory Vacuum Any update on this? I am having similar issue. Purple Trumpet I reached out to YNAB support who indicated that it was likely a temporary outage. Shortly thereafter my transactions began to sync. I have noticed that there is frequently a 1-day lag from the time transactions clear my WF account before they're available for import into YNAB. I received several WF direct Imports over night. Think it was more a slow processing on Wells part before the transactions moved out of Pending. Direct Imports won’t happen till then. I am having the same issue...cannot connect to Wells Fargo Direct Link...eager to start ynab as I have purchased the book, but not interested in the manual option. Hi Cornflower Blue Orca ! Wells Fargo ran into a hiccup over the weekend and our Direct Import partner is just starting to get it ironed out. We're hopeful it will be back up and running in the next day or so. Can you give it another try in the next few days and let us know if it's still giving you trouble? I have been using YNAB since 2016 without issues with wells fargo. This past week i haven't been able to even connect to the bank. I tried all of the troubleshooting tips without any improvement. Bummer because I love YNAB but I may have to take my budgeting elsewhere if this doesn't improve! i have never had trouble with direct import for more than a day prior to this. I took a look but I'm no longer seeing a Wells Fargo connection in your budget. When you have a moment, can you try re-adding it? Even if the connection fails, having it listed will allow us to troubleshoot what's happening. Once you've had the chance to reconnect, let me know and I'll take another look! Hi i am also facing the wells fargo direct import issue! Faness Yeah I get through until I get asked for the verification code - after I enter it YNAB boots me back to username/pw request Link Account screen. We're having trouble connecting to this financial institution. Make sure you can log in to your institution's website, then try again. And yes, I can log in on their website. It looks like the Wells Fargo direct import integration is down again. Any status report on this? I can't connect to Wells Fargo, HSBC, and MACU. Starting to think I made a mistake signing up for YNAB. Hi folks! Our Direct Import partner is on the case to get that connection up and running again. Wells Fargo has been experiencing service disruptions on their end, which are further contributing to connection issues for us and our data providers. When that is resolved, our providers will continue to work on stabilizing this connection! Any progress on the Wells Fargo integration? I took a look and I'm seeing a successful connection to Wells Fargo in your budget. Are you still having trouble with transactions importing? Faness I saw a connection error from YNAB on my Wells Fargo accounts a few days ago. I no longer see the error however transactions are not being imported. I have at least one transaction in my checking account that is now 2 days old and it does not appear in YNAB.